D Sharp is happy to provide support via email. Please contact us at support@dsharpdiabetes.com. +What’s the difference between a web-based app and an iPhone or Android app? but it is a separate product. D Sharp is unique because it uses a cutting edge technology platform (including jQuery Mobile, mind Node.js, MongoDB, HTML5 and cloud hosting) to deliver the same product to whichever networked device you choose. It is essentially a mobile website with the functionality of an app. +How can I look up nutritional information? +I have different carb to insulin ratios throughout the day. How can I get the insulin calculator to recognize this? D Sharp currently allows for only one carb to insulin ratio setting. 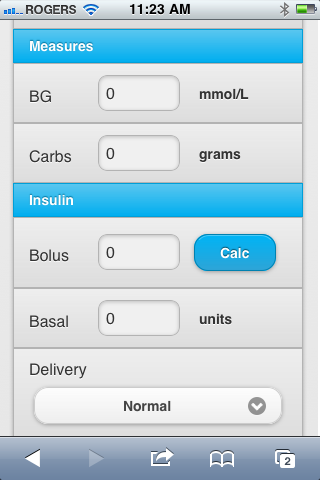 We are working on adding multiple ratios for bolus delivery and different basal rates. If using a pump, always use the pump’s suggested insulin dose. +I have pre-diabetes. Can I still use D Sharp? We encourage you to use D Sharp with a diagnosis of pre-diabetes. Our interface allows the user to customize the app for their treatment. We’re less concerned with what type of diabetes you have and more about how you care for yourself. +I have two children with diabetes. Can I log in once for both accounts? We are working on a single log-in for multiple accounts. We know this is a feature that many parents and caregivers need. For now, it will require logging in and out for each person. Alternatively, if you have two devices you can designate one device for each person. For example, a mother could log her oldest child’s BGs on her phone and her youngest child’s BGs on her desktop. +My teenage son wants to start logging his own BGs. If I log in to his account from my computer, will it log him out of his phone? Logging in on one device will not log you out from another one. In the future there will be an option of adding a view-only or caregiver account to an existing user account, which will allow the entries to be marked by who made them. For now, it’s best to let him know if you make any changes, if he’s the primary user. +Why do I pay monthly when most apps have a one-time fee? The current app market has developed as a one-time purchase for a single device without the option of a subscription service. This is slowly changing as the market and new technologies are developed. D Sharp provides a service to our customers, which is best supported by a monthly fee. We prefer to think of it as an ongoing relationship with added features and tools to keep you on track such as the weekly email updates, blog articles and SMS reminders. Traditional device-based apps tend to sit on the phone unused unless there is an active community to support them. +How is D Sharp able to run on any device? D Sharp is unique because it uses a cutting edge technology platform (including jQuery Mobile, Node.js, MongoDB, HTML5 and cloud hosting) to deliver the same product to whichever networked device you choose. It is essentially a mobile website with the functionality of an app. +Why can’t I access D Sharp when I use my older browser? +Is there a way to sync my glucometer with D Sharp? D Sharp does not have the ability to sync with any glucometers at the moment. We are looking into this feature and hope to offer a partner glucometer in the near future. While syncing does save some time, we also feel that you will gain a better understanding of the cause and effects of your BG readings, insulin or medication use through daily observations.